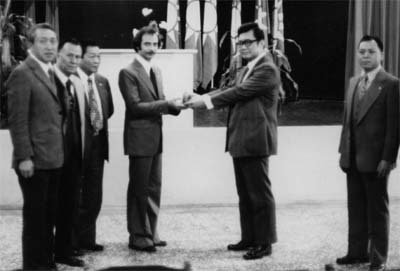 This photograph from the late 70s shows Grandmaster DeMaria in Taiwan, receiving membership into Yang Style of Chang Man Ching's Tai Ji Association. Award given by former President of Taiwan, Mr. Lee. On the right of him is Master Wu Gwo Jung, the Head of this organization and former teacher of Grandmaster. To the left are various members of the Tai Ji Organization.